Not sure how to navigate the largest selection of Amish furniture online on your phone? 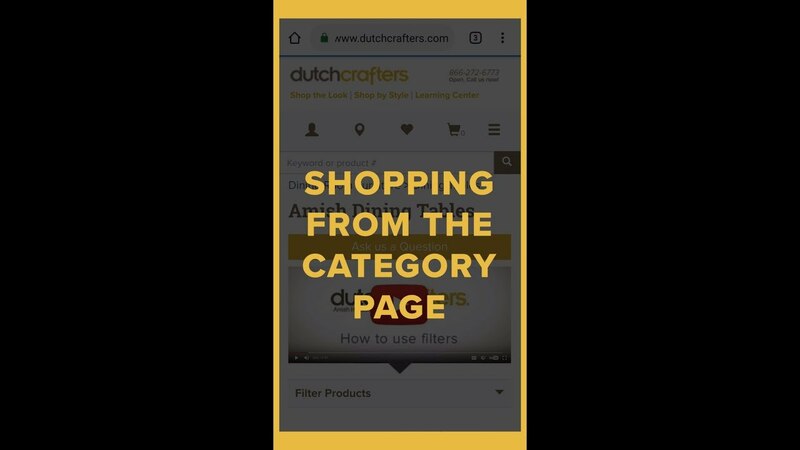 Here’s your guide to getting started shopping from the dutchcrafters.com category pages on a mobile device. Visit DutchCrafters Category Pages (https://www.dutchcrafters.com/Dining-Room-Sets/cat/722) where we make it easy to narrow down your selection to find just what you need. Once you’ve found a product you want to take a deeper look at, select it and move on to the product page. Or, if you need to narrow down your options some more, use the Category filters to take you to a more specific sub-category page to narrow down your interest. But you can always return to the broader category page through the breadcrumb navigation. If you have any questions, don’t hesitate to use the “Ask Us A Question” button or give us a call to speak with a personal furniture specialist. We’re just one click away. Thanks for shopping at DutchCrafters!